Yet the tape also tells the story of the artist himself, the last child in a family of eight children who is “always aware that I had come in near the end of a story” – a story that he tries to recreate through photographs, family oral narrative, the historical accounts of missionaries, adventurers, academics and party officials; and finally, through traveling to China to retrace his father’s journey. 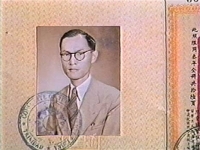 The family photographs, taken before Fung’s birth and lifted from their context, belie the family history. Viewing the pictures of his father by the beach, the narrator remarks ruefully, “I don’t remember my father being that relaxed.” The only picture of China that his father possessed is one o the house bought by his family with money he sent back from Trinidad, not the house in which he grew up. The story is punctuated by the “official” narratives on China by Marco Polo, European missionaries and Roland Barthes that similarly reveal and conceal, clarify and distort. It is only when the narrator interviews his older Jamaican Chinese relatives that a more concrete sense of his father’s history emerges. The relatives had been sent back to China to “learn Chinese culture,” and had been caught in the brutalities of the Japanese occupation and the Chinese civil war. Their graphic testimonies reveal a world of endurance, suffering and courage described with a matter-of-factness and humour that is astonishing. The video then moves to its final segment, the narrator’s journey to his father’s village in China, where we the viewers hope “all will be revealed.” But the charm and the unflinching honesty of this poignant video are such that the director will not give us the long-for denouement. There are obstacles: his mother-his translator-speak Cantonese and the villagers speak Hakka. The questions and answers are mixed p in a three-way shuffle. Other tourists get in the way of his picture-taking and “spoil the purity of the image I’m trying to capture.” There is a dissonance between the memory of his father’s life that he imagines, and the “real” memory. The two cannot come together. I was born and grew up in Trinidad, on the other side of the world from China. In the fall of 1986 I finally went to my father's village in southern Guangdong. This experimental documentary is neither about my father nor about China. Instead, it comes from the search of the children of immigrants for our roots. Whether we will it or not, we are linked or are seen to be linked to a country of which we may have little or no experience. The tape is about history and memory, the experience of colonialism, tourism. It is also about media and is informed by a critique of the conventions and assumptions of much documentary, especially the notions of objectivity and truth. The Way To My Father’s Village is organized into five discrete movement. The first three segments deal with ways of understanding history: official history through documents, personal memory, and oral family traditions. The third segments examines how people from the West have brought our own agenda to looking at China. From Marco Polo to Roland Barthes, Westerners have looked for markets to conquer, souls to save or even intellectual problems to solve. Overseas Chinese have not been immune to these biases. The last dramatized segment of the tape touches on the cultural displacement of the post-colonial era. Thanks: Lloyd Wong, Michelle Mohabeer, David Hole, George Leung, Tim McCaskell, George Smith, Debbie Field, Paul Cheung, Anne-Marie Stewart, Robert Clarke.